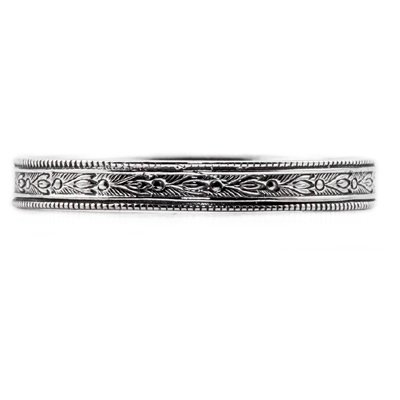 Our Victorian-period floral wedding band is made from an authentic Victorian-era jewelry making hubs that one of our designers discovered, which we now use to recreate our wedding rings as brand new jewelry. Each piece is carefully handcrafted for the ultimate in quality and design. 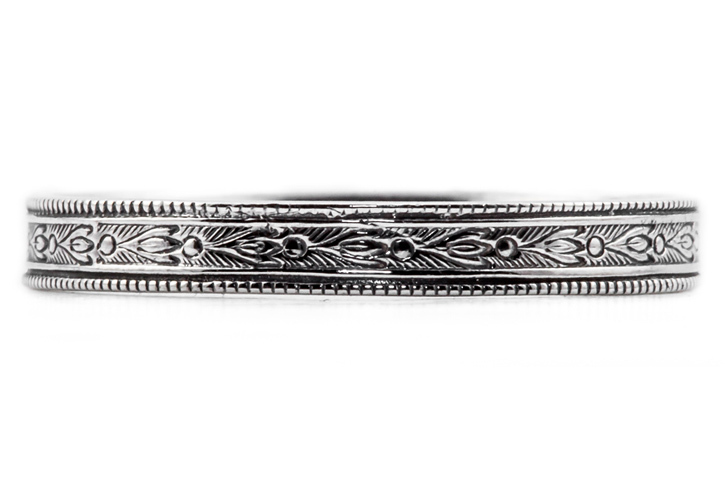 This particular band has a continuous flower pattern which goes around the band with a line-patterned texture behind it and a milgrain edge for a genuine vintage look. Vintage Flower band measures 3.1mm wide. Also available in 14k yellow or rose gold, 18k, or platinum (by request), or sterling silver (shown below). We guarantee our Victorian-Period Vintage Style Floral Wedding Band Ring, 14K White Gold to be high quality, authentic jewelry, as described above.